The average confession made to Padre Pio lasted only three minutes. According to one estimate, Padre Pio heard a total of approximately five million confessions.35 So many people wanted Padre Pio to hear their confessions that they generally had to wait two or three weeks before their turn came.36 The number of people became so large that it was necessary to open an office to give tickets out. The tickets were numbered; they indicated where people were in line for Padre Pio’s confessional.37 This numbering system began to be implemented in January, 1950.38 There was also a rule instituted that you couldn’t go to confession to Padre Pio more than once every eight days. without my having said a word about the problem. Thus he knew my problems better than I did and advised me how to correct them.”56 Among those who came to see Padre Pio, there were professed unbelievers. Some of them came to see him out of curiosity, others to mock both Padre Pio and God. Padre Pio’s Inf luence with People God’s use of Padre Pio to miraculously intercede others was so well known that the people in the area had a profound, even absurd attachment to him. 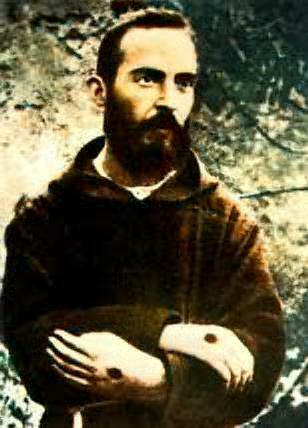 When it was said that Padre Pio might be transferred to a different location, the local people attempted to prevent it by threatening violence if he were transferred. This was, of course, a terrible and sinful decision on the part of these people. It serves to show, however, that Padre Pio’s miraculous intercession was well-known among the people. A Girl Without Pupils Sees! sprang from his bed, quickly locked the front door, and then shouted to his wife: “Now then, where’s that so-and-so monk?” Pushing aside her denials and protests, Giovanni searched the house and found no one. As some time passed, he got sober enough to be convinced by his wife’s sincerity. His wife had been praying to Padre Pio for help; she wondered if this event was the answer to her prayers. She told her husband that she believed it was Padre Pio who had appeared in the bedroom. Giovanni said sternly, “Look, no monk makes a monkey out of me. I’m going down to have a look at this Padre Pio of yours and hear what he has to say for himself. I’ll also find out if he flies!” Some days later, true to his word, Giovanni made a long trip in his taxi to see Padre Pio. He arrived and found Padre Pio. He recognized Padre Pio, and spoke to him. He was thunder-struck and Padre Pio led him to make a confession. After his confession, Giovanni admitted: “What I forgot, he recalled for me. I was weeping…” And at the end of the confession, Giovanni pulled out his Communist Party Membership Card and asked Padre Pio to destroy it. “Yes, I shall. But you have another of these cards in the drawer by the head of your bed. Destroy that too when you go home.” Padre Pio then said to him, “You have given great scandal, and now you must do something to make up for it. For your penance you will go every Sunday to Holy Communion at the last Mass in the main church until I tell you to stop.” In those days, the fasting rule was to abstain from all solid foods from midnight until Holy Communion. Giovanni had to do this for the better part of a year. When Padre Pio’s spiritual Father asked Padre Pio to redouble his prayers, Padre Pio said that this was not possible because his time was “all spent in prayer.”167 Padre Pio said: “What mankind lacks today is prayer.”168 Padre Pio: “We seek God in books, but it is in prayer that we find Him. Prayer is the key that opens the heart of God.”169 Padre Pio: “All prayers are good when they are accompanied by good intentions and good will.”170 Padre Pio recommended people to make short mental prayers, offering everything they did, no matter how trivial, to Jesus Christ.171 Padre Pio, Letter, December 14, 1916: “Try to practice mental prayer, that is holy meditation, and let this habitually be on the life, passion and death of Jesus.”172 Padre Pio would have his penitents recite the following prayer: “My past, O Lord, to your Mercy, My present to Thy Love, My future to Thy Providence!”173 Padre Pio said: “The Lord only allows me to recall those persons and things He wants me to remember. is confirmed without any doubt as we carry the story of 2 Kings further. Shortly after David said: “How shall the ark of the Lord come to me?” we read that the Ark stayed with Obededom, the Gethite, for three months. 2 Kings (or 2 Samuel) 6:11: “And the ark of the Lord abode in the house of Obededom, the Gethite, three months: and the Lord blessed Obededom, and all his household.” Likewise, in Luke chapter 1 we read that Mary (the Ark of the New Covenant) stayed with Elizabeth for three months. Luke 1:56: “And Mary abode with her [Elizabeth] about three months and she returned to her own house.” Also notice that as the Ark stayed with Obededom for three months the Lord blessed his household. Likewise, as Mary (the Ark) stayed with Elizabeth for three months, the Lord blessed her household by granting her a new child, as we read in Luke 1:57. We then read that David leapt and danced before the Ark when he came into its presence. 2 Kings (or 2 Samuel) 6:16: “And when the ark of the Lord was come into the city of David, Michol, the daughter of Saul, looking out through a window, saw King David leaping and dancing before the Lord: and she despised him in her heart.” In the same chapter of Luke we read that the infant in Elizabeth’s womb leapt before Mary (the Ark). Speaking about mankind’s sins, Padre Pio said: “He (Jesus) sees all the ugliness and the malice of creatures in committing them. He knows to what extent these sins offend and outrage the Majesty of God. He sees all the infamies, immodesties, blasphemies which proceed from the lips of creatures accompanied by the malice of their hearts, of those hearts and those lips which were created to bring forth hymns of praise and benediction to the Creator. He sees the sacrileges with which priests and faithful defile themselves, not caring about those sacraments instituted for our salvation as necessary means for it; now, instead, made an occasion of sin and damnation of souls.”207 A blind man named Pietruccio asked Padre Pio what a person has to do to save his soul. Padre Pio answered: “It is enough if you keep the commandments of God and of the Church.”208 Padre Pio was once heard to say about a kind doctor, “What a pity he is a Jew.”209 In a letter on April 7, 1913, Padre Pio said: “How many wretched brothers of ours respond to Jesus’ love by casting themselves with open arms into the infamous sect of Freemasonry!”210 During Padre Pio’s days, various non-Catholic sects were actively trying to convert Italian people. One of these sects opened a kindergarten near Padre Pio. Padre Pio knew that the children were being exposed to criticism of the Catholic faith. Padre Pio was very angry; he said to the superior: “Do something quickly! Go in my name to the archbishop and get permission to open a kindergarten right near Padre Pio 63 theirs…” A kindergarten was started, and in a short period of time the sect had to close their kindergarten and move out.211 Padre Pio fought evil not only with prayer, but also with action.